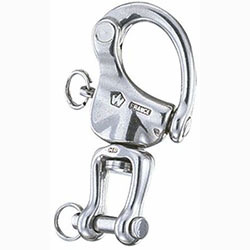 Type: Clevis Pin Eye with Swivel, Length: 4-3/4"
These snap shackles are hot drop forged from a high resistance stainless steel. Only forging creates a superior product, by increasing its elasticity and internal strength. A forged snap shackle will deform long before breaking.